All of Ricochet's initiatives fall under Our 501(c)3 non-profit organization, Puppy Prodigies. 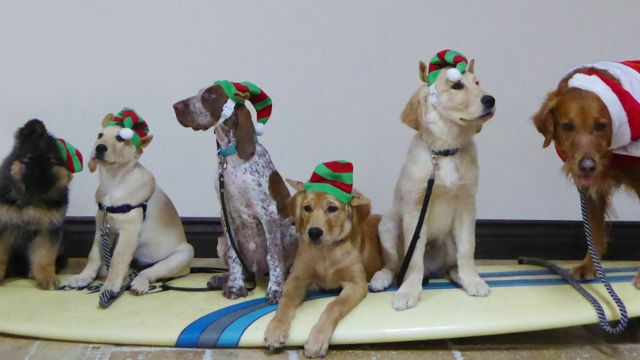 The mission of Puppy Prodigies is to empower both humans and animals. We build the foundation for future teamwork by providing puppies with early interventional learning opportunities and environmental influences at critical stages of development. By doing this, we positively affect behavioral tendencies which will ultimately enhance their life, as well as their human counterpart’s. One of the most important aspects in puppy rearing is socialization. Puppies who do not get adequate socialization tend to be fearful of unfamiliar people, dogs, sounds, environments, etc. As such, we put a lot of emphasis on socialization. On the other paw, military with PTSD have anxiety in social situations, and often withdraw and isolate themselves. As such, we created Operation Socialization as part of our Waves of Empowerment program. This initiative brings service and therapy dog puppies from birth through advanced training together with veterans suffering from PTSD. ​We go into the community as a group, and each veteran is assigned a puppy. We maintain a plan that doesn't put the puppy in danger of infectious diseases, but still affords the opportunity for socialization. We find places where the puppy can meet a myriad of different people that are low risk environments. Depending on the puppy's age and shot history, they may be held, secured in a stroller or walking on a leash. While it's typical for veterans with PTSD to feel awkward if approached by people, in this circumstance the encounter is non-threatening because the interaction is joyful and the focus is on the puppy. Puppies by nature, elicit positive interactions between people. 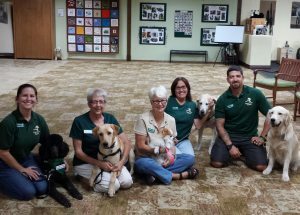 The puppies learn from the veterans, and the veterans have an outlet that reduces loneliness, anxiety and isolation. In addition, petting the puppies can stimulate circulation and reduce stress, anxiety and lower blood pressure. ​We assure that each new experience is pleasant and non-threatening for the puppy and veteran. We start in quiet places and gradually progress to busier ones. As the veterans help the puppies feel safe with the socialization process, they also reap the benefit of the human-animal bond and realize their anxiety levels have decreased. This facet enables both the puppies and veterans to experience positive interactions with strangers of all kinds, while feeling more comfortable in social environments. The Veterans also feel a sense of re-connection to their community, while at the same time they find a new sense of purpose. Since the puppies will go on to be therapy dogs or service dogs, the veteran is involved in helping many different individuals both directly and indirectly in the spirit of puppy love for the mutual benefit of human and canine. ​​If you'd like to join us for an Operation Socialization session or other activities, please complete this registration form. ​If you'd like to join us for an Operation Socialization session, or are interested in other activities, or you'd like to surf with Ricochet, please complete this ​registration form. ​In addition to our veteran and special needs volunteers, we are always looking for water men and women, photographers, videographers, cheerleaders and friends! Just visit our volunteer opportunities page. We have opportunities both locally and globally, so it doesn't matter where you live... you can still get on board! Many of our veterans come to us through Paws'itive Teams Emotional Support Dog program that Ricochet is part of. We have collaborated with Paws'itive Teams to provide Operation Socialization to their graduates. The classes are designed specifically for veterans with PTSD or TBI. The primary mission of these classes is to teach veterans better communication skills with their personal dog so that their dog can learn to assist in managing their PTSD or TBI symptoms.